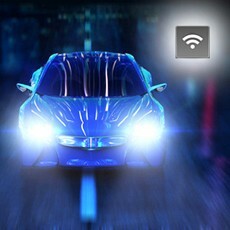 Connected car services have evolved from being a differentiating factor to a common feature with a high attach rate among the premium car brands and are rapidly becoming increasingly common in mid-range vehicles. GM’s OnStar was launched 20 years ago and is today the market leader worldwide with well above 14.0 million users in total, out of which 12.3 million were in North America by year-end 2017. BMW includes telematics hardware as a standard feature on all its cars sold in 45 markets worldwide and has the second largest user base of an estimated 8.0 million equipped vehicles. PSA Group is currently in third place with 2.9 million connected vehicles in Europe. The carmaker launched an emergency and assistance call service already in 2003. Additional automotive OEMs with over 2 million telematics subscribers also include Hyundai, Mercedes-Benz, Toyota/Lexus and FCA Group. “There are several connected car services that experience growing demand from stakeholders including consumers, car manufacturers, governments and various third parties as awareness of the value of telematics spreads”, said Martin Svegander, IoT analyst at Berg Insight. The leading carmakers are gradually exploring new use cases and business models for telematics such as premium concierge services, usage-based insurance and personal carsharing. 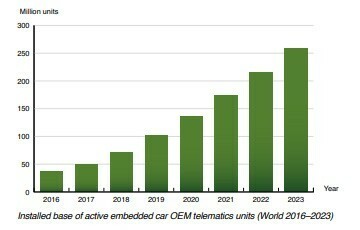 The post Embedded car OEM telematics subscribers to reach 258 million worldwide by 2023 appeared first on IoT Business News.